What is a domain auth code? A domain authorization code is a unique 6 to 32 character code assigned to a domain. It is designed to prevent fraudulent or unauthorized transfers. This code is an extra safety feature, similar to a credit card verification code or PIN for your domain, that helps ensure that the customer transferring the domain is indeed the owner of that domain. How do I find my domain's auth code? For any domain that you registered through (mt) Media Temple, you can retrieve your auth code in your Account Center. From the Overview page or Domains tab, select the domain you want to transfer. 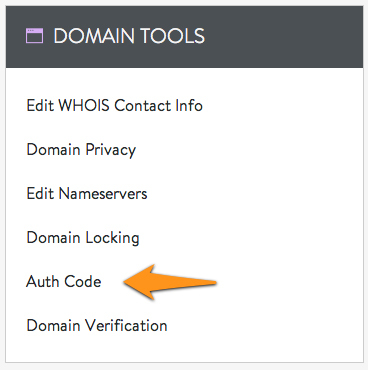 Click on the Auth Code icon under Domain Tools. Click the Email Auth Code button. The email will be sent to the current administrative email. If needed, you may edit the Admin Contact before continuing.